All existing students / assistants that have been assigned for the active week are indicated with different coloured backgrounds. You can resize the window (this position gets saved). The Last Study and Next Study columns are not visible for student items on or after 7th January, 2019. There is a Edit menu on the student selector window. Use this to Copy the current student data to the clipboard (tab delimited). Also, please remember that when you are choosing an Assistant, that the list of Publishers is restricted to just those with the Assistant assignment. Look here for full details about how to use the filters effectively to limit the publishers displayed in the list. 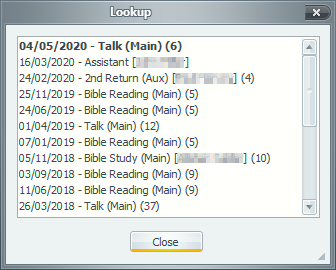 Clicking on the Lookup symbol will display a list of the most resent assignments given by the student (in descending date order). In addition, it will display all upcoming assignments for the student. 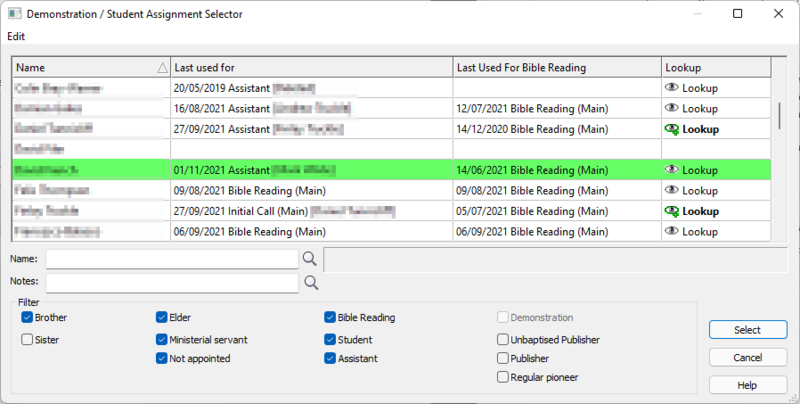 This includes those future assignments on the current schedule, and any held in the assignment history file. Future assignments are included as this can be useful if you need to make changes to existing student arrangements. This window can be resized.